When I was asked to write a piece on Baynetna, the only existing Arabic library in Berlin, I was immediately interested. I have always found deep reserves of empathy and solace within the texts of others. I believe literature is one of the most radical mediums of communication that humans possess, as it allows conditions of existence to be relayed viscerally through language, therefore facilitating greater understanding of experiences that lay beyond the individual. All literature is, in this sense, an act of translation. Often, when I read a work of poetry, fiction, or creative nonfiction, it is hard to pinpoint the specific site that triggers my fascination. It is as if the non-normative use of language transforms everyday reaction to stimuli into something more spiritual, emotional, and accessible. As a child, my favorite books were stories of adventure and survival. These narratives often occurred in contexts spatially and temporally disparate from my own, and yet somehow managed to be relevant to my own experience. From this vantage point — but, as an American, knowing relatively little about Berlin and its sociopolitical structure — I spoke with Muhanad Qaiconie, the founder of Baynetna, about his ongoing project. Muhanad explained that Baynetna is, above all, a place for exchange — of languages, culture, ideas, resources, and support. The idea for the library came to him when he was in a camp in a village outside of Munich, waiting for his residency papers, with nothing to do but scroll through Facebook and wait. He found an article by a German journalist that translated to Arabic. Having enjoyed the article, he friended the journalist on Facebook, and they started to talk. MQ: She asked me about my situation. I told her, ‘I’m in the camp. It’s boring.’ She said to me, ‘If you want, I can send you some books, and you can read them.’ And I told her, ok, but are there any Arabic books? And she said to me, “there is no Arabic library in Germany, but I can order them online.” So when she said there is no Arabic library in Germany, and specifically no Arabic library in Berlin, the idea came to my mind to create one. There were some open before, but they had all closed. [The journalist and I] became friends. I moved to Berlin and we met each other in person. I told her my idea for an Arabic-German library, and we started to work together [on the project]. We got the place, and started contacting people to ask for donations. The space is in a refugee camp run by the Red Cross (Stresemannstraße 95/97, Kreuzberg, Berlin). The Red Cross decided to make the last two floors for projects. An organization called Zusammenkunft (that facilitates mutual support and exchange of projects and initiatives between “Old Berliners” and “New Berliners,” especially refugees) applied for the two floors. We applied for a space there — a lot of people did — and [Zusammenkunft] took fifteen projects, the library being one of them. 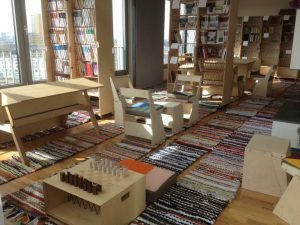 The process of acquiring the space took about four months, but making the furniture and getting enough books to begin with took about a year. There are a lot of offices and a diversity of projects. Some people are making newspapers, others are leading workshops for children. We are all sharing the space, so it’s not just me there. We divide the time. The library is open Thursday and Friday from 10-6 Saturday, and Sunday from 12-6. Baynetna is informed by the Syrian Revolution and the displacement of Arab people, but its purpose and power cannot be reduced to this circumstance any more than an individual can be defined by a state. Baynetna means “between us.” This name serves to emphasize the fact that the space is not simply a library, but a meeting place for individuals of diverse backgrounds and identities who have found themselves in the same city. Baynetna is a place to expand one’s understanding of the experiences and cultures that exist within Berlin. It embraces the idea that acknowledging and learning from difference while recognizing commonality is necessary to nurture community beyond origins and citizenship. MQ: I made it much more like a salon, not just a library. There are two main guiding purposes. One is for the library itself to function as a source for Arabic books. Most Arabic people are not coming to Germany with books. Coming this way, by boat, from Turkey to Greece, nobody would carry books. So I want to offer this to them. I want it to be so big one day, a center for anyone who is searching for something they’re unable to find, whether it is a translation of a German book into Arabic or an intellectual space to share with others. And the next thing is, because it’s much more like a salon, there are activities, readings, book signings, poetry nights, even painting, music — anything in the cultural field. So this makes the purpose [of the space] about coming together. For events I am also counting on the German people — that for music events, they will come. For readings, I am trying to bring in translators to translate the text to German, so we have both languages. The library has received a huge amount of interest since it opened about one year ago. Since making an official Facebook page for the organization, the Baynetna team has received many messages of support as well as future proposals from interested individuals. The majority of proposals are from other young people and activists interested in hosting forums in which art, music, and other aspects of culture are produced, celebrated, and learned about. MQ: Other people want to make projects but they can’t because it’s so hard to get a place and financial support. But the library is open. If someone has a workshop or idea or wants to do something, I’m saying yes, in general. To use the space to its fullest, if I can offer something, I will, [though] it’s limited because I need resources as well. But I am open to other ideas and to collaboration. I feel that it will be so big some day because I can tell just now from the interest. We are only open four days a week, but a lot of people are coming. And for our book signing event, I published it [on Facebook] two days ago, and two hundred people have shown interest. There isn’t space for two hundred people–the place fits up to 100–so I had to ask them to send me an official email if they are sure they want to come, with their name. I’m making the list now. But it shows that there is a big number of people who are interested in this type of space and event. Despite the positive response, which has affirmed his belief that a space like Baynetna is needed in Berlin, Muhanad and the team still must deal with the issues of financial support. They are, for the most part, young people and students who cannot afford to fund a major project single-handedly, especially one that requires materials be shipped from overseas. MQ: Nobody is supporting the project money-wise, really, so I am still suffering in this. All of the books were donated. We have about 800 books now, from one year of collecting. Some of the books are not so good because the people are throwing out what they don’t want. So if I want really quality books, I have to order them, and bring them from Arab countries to here. It is costly, and I can’t pay for it. I’m trying–every month, I’ll buy one book on the Internet. But this is not working. And for events I am just counting on the nice people that I know. If I want to invite a writer, or musician, or painter, and they are living somewhere else, I need to cover the cost of the travel, or else no one will come. I am depending on the people who are willing to take on the cost because they want to support us. But this will not work over a long period of time. When asked how he sees the project developing over the long run, Muhanad is full of ideas. The genius and beauty of the library is that, though the scope of its ambition is staggering, the means through which it may be achieved is simple: through literature, art, cultural events, and regular human interaction. Baynetna will soon need a new space, as they only have their current space until the end of this year, and for that they will need funding. In addition, the library needs books in order to fulfill its trilingual vision. MK: The idea is to have three languages — Arabic, German, and English. What I want is to have the Arabic books translated to German or English or both, and the German and English literature translated to Arabic. Ideally, there would be the same book in three languages. But I need to order these books. I found here a publishing house whose books are one page German, one page Arabic. I’ve ordered three books from them. I love this idea–to have the same sentence in German, the same sentence in Arabic. Also, that way, if you want to learn–if you have a nice passage on your mind, or a nice poem–you can see how it looks and sounds in the other language.